You need to install the following software to build SoftEther VPN for Windows. Microsoft Windows XP, Vista, 7, 8 or later. 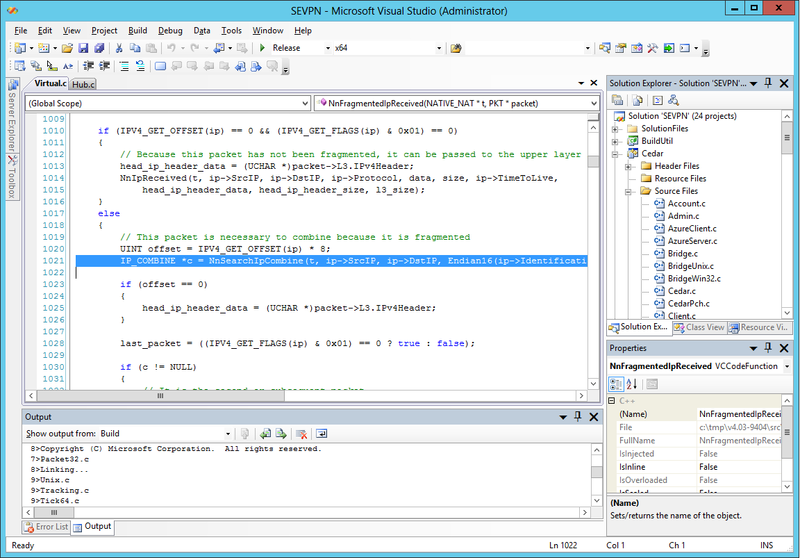 Microsoft Visual Studio 2008 with the latest SP (SP1 9.0.30729.4462 QFE). Visual Studio 2008 SP1 is required to build SoftEther VPN on Windows. Please make sure that VS2008 'SP1' is installed. Visual Studio 2010, 2012 or 2013 is currently not supported. Visual Studio 2008 Express Edition is not supported. Standard Edition, Professional Edition, Team System or Team Suite is required. The following steps will build all SoftEther VPN program files, and also build the installer packages of SoftEther VPN. It is very easy. Run the "BuildAll.cmd" batch file in the "src" directory. Wait until the building process will complete. The built files are stored on the "output" directory. If you are a programmer, you can open the SoftEther VPN solution file with Visual Studio to customize. Open "src\SEVPN.sln" and enjoy it.